AAC/AT Interdisciplinary Assessment Team Initiative is a collaborative effort between the Exceptional Children Division of the NC Department of Public Instruction and the Carolina Institute for Developmental Disabilities (formerly the Center for Development and Learning) at the University of North Carolina at Chapel Hill. The goal of this ongoing project is to establish a network of school-based teams that have the capacity and capabilities to effectively assess children with significant communication difficulties and to determine their need for alternative or augmentative communication systems or devices. With contractual support from DPI, the CIDD LINK team provides annual workshops, consultation and technical assistance to selected regional INTERACT teams (INteractive TEchnology Reaching All CommunicaTors). 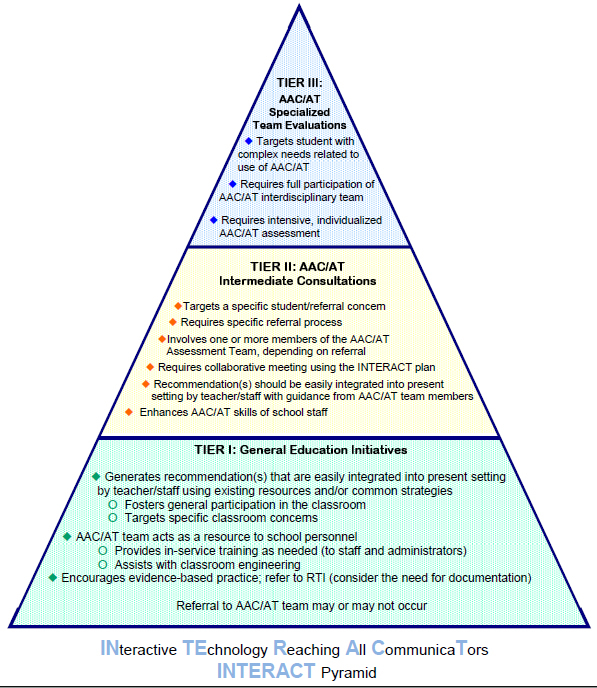 Specific emphasis is given to a three-tiered progressive assessment approach. Currently, the AAC/AT Assessment Team Initiative includes 21 teams across the state; it is anticipated that new teams will be added yearly.